I always advise young students intent on reaching fame to study invertebrates…uncounted millions remain to be discovered, even in such unlikely places as Manhattan’s Central Park (a centipede, in recent years). Almost every week, an exciting new insect, arachnid, crustacean, or other invertebrate is uncovered, and some of those found in 2014 have been especially surprising. Included among this year’s amazing finds are “living skeletons”, see-through snails, gymnastic spiders, and screaming-pink millipedes. Most have barely been studied, while others were found earleir but are only now being described in detail. The following discoveries represent just the tip of the “new species iceberg”…please be sure to post your own favorites below. Unlike many of its relatives, this conspicuously-colored millipede shuns cover and is out and about by day. 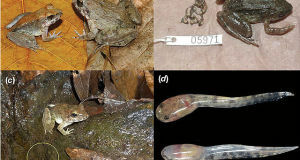 Discovered near Thailand’s Hup Pa Tard cavern, it is well-protected by spiny legs and an arsenal of cyanide-like gasses (these same gasses once gave me quite a scare: please see the article below). 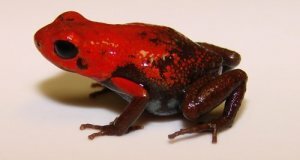 Several of its relatives are bright red in color. This relative of the Huntsman Spiders is named after a move used during gymnastic routines. 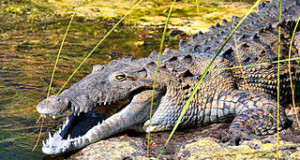 When attacked, it engages in a series of forward and backward flips and is thus able to travel at twice its normal running speed. I wonder if the odd movements do not serve to confuse predators as well. It is the only spider known to use this form of locomotion. A robot based on its movements is being developed for possible use in agriculture and ocean/space exploration. The Flic-Flac Spider is known only from the sand dunes of Morocco’s Erg Chebbi Desert. 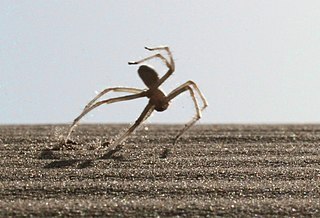 Perhaps the difficulties inherent in moving across sand have contributed to the evolution of its unique escape style – other desert-adapted spiders and insects are able to roll away from danger. Southern California’s Santa Catalina Island is best known for sunny weather and beautiful ocean views. But a cave within one of its offshore reefs was found to contain a ghoulish shrimp-like creature that looks very much like a living skeleton. Dubbed the Skeleton Shrimp (Liropus minisculus), this amphipod has a translucent exoskeleton that lends it an oddly bone-like appearance. 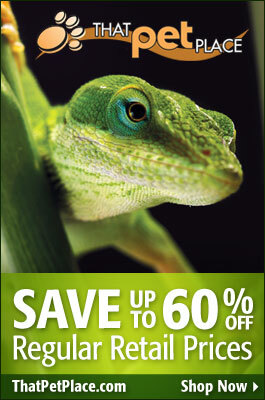 Its otherworldliness is further enhanced by the “raptorial claws” – mantis-like forelimbs used to grasp prey and mates. by the few who have seen it as “ghostly”, cannot fail to make one wonder what else awaits discovery far beneath the earth’s surface. Although quite a few sea creatures glow in the dark, luminescence is rare among land dwellers. But the Lightening Roach, known from only a single specimen collected in Guatemala, has developed this ability to a remarkable degree. Entomologists theorize that this light-producing roach mimics a toxic, glowing click beetle found in the same area. Unfortunately, a volcanic eruption in this insect’s only known habitat has cast doubt on its continued existence. Other glowing roaches have also been found in recent years…none are well-studied, and all appear to be rare. Great report. Two minor mistakes: The scientific name of the pink millipede is D. purpurosea (vs. puruposea) and the roach L. luckae is known from a single specimen from Ecuador (vs. Guatemala).